A rendering of the David M. Rubenstein Forum, to be located at the southeast corner of Woodlawn Avenue and 60th Street. The University has released renderings of the David M. Rubenstein Forum, the 11-story conference and events center to be built on the southeast corner of East 60th Street and South Woodlawn Avenue. The building was designed by Diller Scofidio + Renfro (DS+R), the architecture firm behind New York City’s High Line. DS+R was also a finalist to design the Obama Presidential Center. 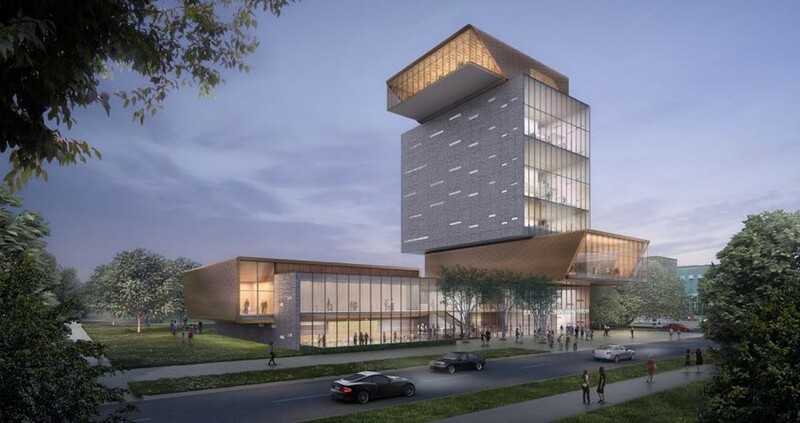 A wide two-story base will be topped by a tower of stacked, boxy sections. The modular structure will be capped by a cantilevered top floor. The variety of spaces offered by the Rubenstein Forum will help remedy the lack of campus venues for conferences and large events, Executive Vice President of the University David Fithian said. “Too often events hosted by the University are held in other parts of Chicago, and our guests are denied the opportunity to experience the intellectually dynamic and beautiful campus that we have in Hyde Park,” Fithian said. A multipurpose space that can accommodate 600 people will be located in the building’s base. Architectural plans also show a ground-floor restaurant lining the building’s northern face. Above the base, a 285-seat auditorium will jut out over the building’s northern entrance, offering views of Rockefeller Chapel. The remainder of the tower will consist of a mix of meeting rooms and more versatile, informal spaces. The cantilevered top floor—a space for symposiums, receptions, and other gatherings—opens to the East, providing lake views. The gray- and copper-toned building will rise 165 feet above the Midway. To compare, the Logan Center is 170 feet tall. Over the last several weeks, demolition crews have razed the Mott Building, a mid-century office building that stood on the future site of the Rubenstein Forum. The new structure will take up the block’s northwestern portion, and landscaped grounds will lie to the building’s south. Site plans leave room for a future academic building on the eastern side of the lot. The project was unveiled last Thursday evening at a community meeting. The University also presented its plans for the transformation of New Graduate Residence Hall into the Keller Center—the future home of the Harris School of Public Policy—as well as a new building for its Woodlawn charter school on East 63rd Street and South Greenwood Avenue. The Rubenstein Forum will round out the trio of Campus South projects. University spokesperson Calmetta Coleman said the Rubenstein Forum’s construction start date and is still an unknown time of completion, although previous reports stated that the University aims to break ground in 2016 with completion in 2018. The cost of the project was not made public. The proposed conference center will join two other new projects south of the Midway.